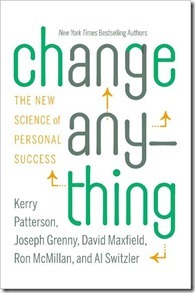 I’ve been reading this great book lately, Change Anything: the New Science of Personal Success, by Kerry Patterson & co. Thus far, I have to say I’m impressed—both because of the scientific research they reference (yeah, I’m a science geek) and because the tenets they propose feel true. That’s one of the paths to change they describe. Sounds counterintuitive, right? Until I start thinking about my life and the places where I have successfully created a change. Never once did I succeed because I browbeat, shamed, badgered, or guilted myself into it. * Nope, change occurred when I started to focus on the positive. For ex., I was never a big exerciser. I was the geeky kid reading books on the playground and daydreaming in the outfield (if you were unlucky enough to have her on your team.) By the time I finished elementary school, I’d firmly identified myself as a non-athletic exercise-hater, and cold hours on the hockey field in high school (in shorts—gotta love PE uniforms!) did nothing to change my mind. I *know* some of you know what I’m talking about! Sure, I knew exercise was good for me. In theory, I wanted the benefits exercise had to offer—strength, more energy, better sleep, improved health. I’d tell myself I “had to exercise” and vow to walk/run/do yoga/jump rope every day or else…and it would never last. Now I’m running ~10 miles a week. Not a lot, maybe, but I’m loving it. Me, the geeky kid who hid at the back of the crowd for dodgeball! I’m convinced that the #1 reason I stuck with it was that I started focusing on the difference running was making in my life. I loved that I’d have more energy afterward. I loved that it sparked long plot discussions with my sweetheart (who was game enough to run with me, even though running is *not* his thing). I loved that it took less time than a trip to the gym and I loved the multitasking aspect—I could walk the dogs at the same time. 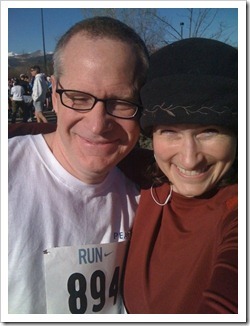 Little by little, love edged out my hatred of exercise, until running—which I hated—became the thing that I loved. I think change is on my mind right now because I’ve been struggling with that writing/other work/life/laundry balance. Struggling more than usual, I mean <grin>. I want to make some changes—you know, like make forward progress on a stalled project while maintaining momentum on my novel WIP. As writers, we’re going to hit those moments in life when we need to change in order to move forward more successfully. Maybe you need to get up an hour earlier to gain some uninterrupted writing time; or maybe you need to set limits on your social media, or give up that sitcom, or learn to say “no” to people who think work-at-home means not-really-working. Change is hard. But when you’re moving toward something better, you can make change easier by focusing on what you love—until maybe, someday, love overcomes all barriers and what you used to hate, you love. What about you? What change are you trying to make right now—and what is there to love in it? Please share in the comments! * Hence the bag of chocolates in my fridge…oh wait, I wasn’t trying to change that. *bag of chocolates* LOL! Now THAT I can relate to. I'm totally impressed that you run 10 miles a week. That's amazing. I'm learning to look for the positives in the situations that bother me. It's taken me a long time to get here, but I sure do notice how much more peaceful my life is when I think this way. Very good point! This sounds like a book I would enjoy reading. I think I need to check it out. So glad you shared this. You're totally right! Julie, glad I'm not the only one hoarding those chocolates. They're inspirational, I swear! Abby, I haven't finished it yet, but I'm enjoying it thus far! I might have to read that book, too. You hit on my two biggest challenges now — getting healthier and being more diligent about my writing. Who was it that said (and I paraphrase), "I hate writing but love to have written"? The process is always what we hate the most. Wonderful post, Cheryl! We must be on the same track because I'm on an exercising kick and a self-help-ish one too. Just finished reading "Write it Down, Make it Happen." Fab book! Huge congrats on your running accomplishment, and good luck making those big decisions. And thanks for the book recommendation! Hi Julie F, yep, those are definitely my two big struggles–and they seem to compete with each other. I find more time to write, it seems to come at the expense of exercise time or cooking time, and vice versa. Thanks, Charissa. I think the tough part for me is getting started when a project seems overwhelming. That's a skill I need to enhance! Jill, I like that book just from its title! Definitely going to look it up. I just wanted to share that i found this so inspirational that is brought me to tears. Thank you for writing such an amazing piece.